Recently my colleague and co-blogger, Charles Stewart, wrote a very interesting post, “Voters Think about Voting Machines.” His piece reminds me of something a point that Charles and I have been making for a long time — that election officials should focus attention on the opinions of voters in their jurisdictions. After all, those voters are one of the primary customers for the administrative services that election officials provide. Of course, there are lots of ways that election officials can get feedback about the quality of their administrative services, ranging from keeping data on interactions with voters to doing voter satisfaction and confidence surveys. But as election officials throughout the nation think about upcoming technological and administrative changes to the services they provide voters, they might consider conducting proactive research, to determine in advance of administrative or technological change what voters think about their current service, to understand what changes voters might want, and to see what might be causing their voters to desire changes in administrative services or voting technologies. In this article, we study previous experiences with voting technologies, support for e-voting, and perceptions of voter fraud, using data from the 2015 Cooperative Congressional Election Study. We find that voters prefer systems they have used in the past, and that priming voters with voting fraud considerations causes them to support lower-tech alternatives to touch-screen voting machines — particularly among voters with previous experience using e-voting technologies to cast their votes. Our results suggest that as policy makers consider the adoption of new voting systems in their states and counties, they would be well-served to pay close attention to how the case for new voting technology is framed. This type of research is quite valuable for election officials and policy makers, as we argue in the paper. How administrative or technological change is framed to voters — who are the primary consumers of these services and technologies — can really help to facilitate the transition to new policies, procedures, and technologies. This entry was posted in election administration, election fraud, US Election, Voter fraud, voter registration, voter registration fraud, Voting technology on September 4, 2018 by Michael Alvarez. The New Mexico Secretary of State Dianna Duran has provided 64,000 registered voter names to the New Mexico State Police for fraud examination. This represents about 5.3% of all registered voters and about 7.7% of voters in the 2010 election. No details were given on how these voters were identified, but that represents an enormous number of records to work through. No process was identified for how the New Mexico State Police would examine the records or how long it would take to review them. More information about this story can be found here. The article mentions the possibility of administrative errors. This is very likely. My own experience with working with voter registration files is that they are somewhat dirty. By that I mean the file consists of missing data, incorrect data, duplicate entries, etc (also see an excellent report on the quality of voter registration files by Stephen Ansolabehere and Eitan Hersh). What is the problem? A major part of the problem is that the data collection and entry process leads to data entry errors. Individuals register to vote in their own handwriting and then administrative staff interpret and enter the information into the electronic system. Obviously this is a process rife with numerous points for potential error. One possible solution to this is to move to some sort of electronic registration, perhaps self-registration on-line and/or augmenting information in voter registration files with information from other state and federal databases to obtain more correct information. See for example the op ed piece by Mike and Dean Logan. As the investigation progresses, it is worthwhile for us to understand the process. One thing we can learn from the process is where the problems exist and how to fix them. This is an opportunity for us to collect important data on administrative problems with the voter registration process. This entry was posted in Voter fraud, voter registration, voter registration fraud on June 15, 2011 by akteson. As part of my pre-Thanksgiving clean-up, I have finally gotten around to posting the data sets and documentation for three surveys my colleagues and I did in 2007 and 2008 to gauge the quality of American elections. The studies were funded by Pew, as part of their Make Voting Work Initiative, along with the late, great JEHT Foundation and AARP (for the Nov. ’08 study). The studies were conducted in November 2007 (gubernatorial races in KY, LA, and MS), February 2008 (15 Super Tuesday states), and November 2008 (all 50 states). Lots of questions about how well elections were run, from the perspective of voters, plus some questions about why non-voters didn’t vote. One feature of these datasets is that we did parallel administrations using the Internet and telephone (random digit dialing), so people interested in how these two survey modes differ should find things of interest to them there. This entry was posted in early voting, election administration, election fraud, election reform, Uncategorized, US Election, Voter fraud, voter registration, Voting technology on November 25, 2009 by cstewart. Felony charges were filed and an arrest warrant issued Monday for an Orange County man suspected of committing voter registration and election fraud, Secretary of State Debra Bowen announced today. An investigation by the Secretary of State’s Election Fraud Investigation Unit revealed that Nativo Lopez of Santa Ana leased office space in the Boyle Heights area of Los Angeles and allegedly registered to vote at that commercial address although he lived with his family in Orange County. Lopez also allegedly cast an illegal ballot from Los Angeles in the 2008 Presidential Primary Election. On June 22, the Public Integrity Unit of the Los Angeles County District Attorney’s office charged Lopez with four felonies: fraudulent voter registration, fraudulent document filing, perjury, and fraudulent voting. A warrant was issued for his arrest and bail was set at $10,000. Under state law, registering where you are not entitled to vote is a felony punishable by up to three years in prison; fraudulent voting is also a felony punishable by up to three years in prison. This entry was posted in Uncategorized, Voter fraud on June 24, 2009 by Michael Alvarez. I wrote a few days ago about some data we collected as part of the 2008 Cooperative Congressional Election Study (CCES), testing assumptions about “voter confidence,” a survey respondent’s perception about whether their vote will be counted accurately or not. We wanted to test for two other patterns that have been reported in past work by Alvarez, Hall, and Llewellyn. First, are their mode effects–do voters who cast ballots at the precinct place express higher levels of confidence than those who cast a by-mail ballot or early ballot? 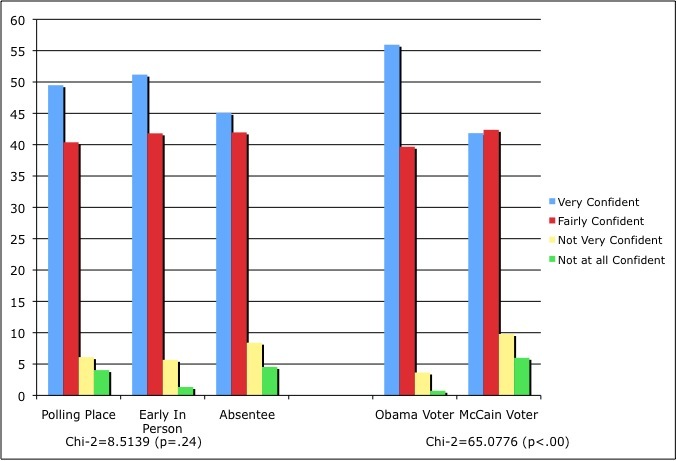 Second, are voters who cast a ballot for the loser (in this case, John McCain) more suspicious about the validity of the count? This entry was posted in Uncategorized, Voter fraud on April 21, 2009 by gronke. I’m off to Atlanta — the site of yesterday’s Senate runoff election — for two days of discussion regarding voter registration systems as part of the ongoing National Academy study of Statewide VR systems. So if you happen to be in the area, Thursday’s open sessions look pretty interesting. Unfortunately I can’t find the URL for the workshop agenda on this slow 2G connection I have, but I’ll dig it up later when I have a faster connection. This all assumes that I get to Atlanta today; we’ve been sitting here in the plane at LAX for 45 minutes waiting for the pilot who is supposedly stuck in traffic (would they wait for a passenger who didn’t plan ahead and got stuck in traffic?). UPDATE: here’s the current URL. This entry was posted in Uncategorized, Voter fraud on December 3, 2008 by Michael Alvarez. Title says it all. Details are still being worked out in some counties, but it looks like election officials are ramping up to start early voting on Monday Friday! And it seems like the election just ended…. WAIT! It did!! This entry was posted in Uncategorized, Voter fraud on November 12, 2008 by gronke. CNN has the story. It is interesting to see how both campaigns are using social networking tools on the Internet to encourage supporters to register and to get absentee ballots. This entry was posted in Uncategorized, Voter fraud on September 18, 2008 by Michael Alvarez. 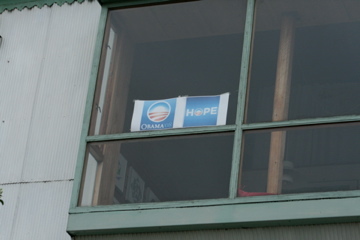 US Elections in Valparaiso, Chile? Readers might be interested in these signs which we saw yesterday in Valparisaio, Chile — in the window of a house overlooking the city’s harbor. Click here for the photo, my slow internet connection won’t let me put the thumbnail in this post. This entry was posted in election administration, election reform, Uncategorized, Voter fraud on August 19, 2008 by Michael Alvarez.